For many, Beverly Hills is synonymous to shopping - and with good reason. 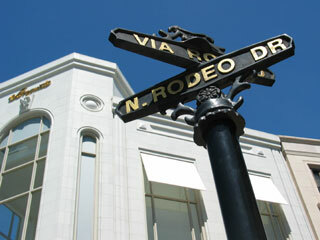 At the center of the city's "Golden Triangle" is the infamous Rodeo Drive (website). Perhaps one of most well-known streets in the world, Rodeo Drive is a haven for anyone who has a passion for fashion. The street itself stretches from Sunset Boulevard to Wilshire Boulevard, but the celebrated shopping district is only three blocks long. As seen in Pretty Woman, these short three blocks are concentrated with an overwhelming array of designer labels, including the likes of Giorgio Armani, Bulgari, Cartier, Christian Dior, Dolce & Gabanna, Escada, Gucci, Harry Winston, Louis Vuitton, Prada, Valentino, Yves Saint-Laurent and more. For those of us who aren't in the mood to max out our credit cards, window-shopping is always a safe option here. One of the highlights of Rodeo Drive is Two Rodeo (website), a European-style shopping center, complete with Old World cobblestones and street lamps. Located at the northeast corner of Wilshire and Rodeo, Two Rodeo most closely resembles a film set with its winding faux street, piazza and balconies. High-end brands like Versace, Jimmy Choo, Judith Ripka and Tiffany & Co. can be found here. The center also boasts three upscale restaurants: the seafood grill McCormick & Schmick's, the acclaimed sushi spot Urasawa, and 208 Rodeo, offering a patio that makes for prime people-watching. Tourists tend to pose for pictures in front of the Spanish steps and fountains. The cash-strapped will be relieved to know 208 Rodeo offers free valet parking during the day. A recent addition to Rodeo Drive is its Walk of Style, which honors visionaries in the field of fashion. Past winners of the Walk of Style Award include Tom Ford, Mario Testino, Salvatore Ferragamo, Gianni and Donatella Versace and Manolo Blahnik, amongst others. Permanent plaques paying tribute to the inductees are embedded in the sidewalks of Rodeo Drive. Also celebrating the recipients is a 14-feet tall sculpture made of solid aluminum blocks from the artist Robert Graham at the intersection of Rodeo Drive and Dayton Way. Of course, there is more to Beverly Hills than just Rodeo Drive, even when it comes to shopping. One block east of Rodeo Drive lies Beverly Drive, where relatively affordable options are available. National retailers like Williams Sonoma, Anthropologie, The Gap and Crate & Barrel dot this street, as do the famed GEARYS Beverly Hills and XIV Carats. Eateries on Beverly Drive include Nate 'n Al Deli, a Jewish deli with a loyal following among locals and celebrities, and the Cheesecake Factory. Those who can't get enough of the silver screen will get their fix at the Paley Center (formerly known as the Museum of Television & Radio). One block east of Beverly Drive is Canon Drive. This street features a handful of local boutiques. Celebrity favorite Spago Beverly Hills is also here, as is spendy Mastro's Steakhouse. Anchoring the southern end of the "Golden Triangle" is Department Store Row on Wilshire Boulevard, spanning from Roxbury to Rodeo. This strip of Wilshire Boulevard boasts none other than Barney's New York, Neiman Marcus and Saks Fifth Avenue. 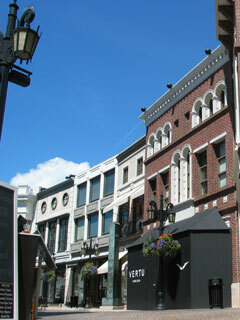 These four blocks are also home to Burberry, Escada Boutique, Mikimoto Jewelry and Niketown, amongst other stores. Over 40 Los Angeles attractions, tours, museums, activities and more - all for one low price! Includes over 40 L.A. Tours and Attractions! BONUS: 3, 5 and 7-day cards include Universal Studios!